Nathan Stebbins, a biochemistry and cellular and molecular biology major at the University of Tennessee, Knoxville, has been named a 2010 Barry M. Goldwater Scholar. 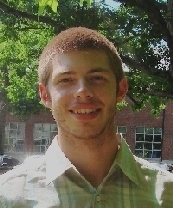 Stebbins, who is currently conducting research on cancer biology as an undergraduate, was nominated by NIMBioS to attend the Transforming Undergraduate Biology Education: Mobilizing the Community for Change conference held in Washington, DC, in July and organized by the American Association for the Advancement of Science. Stebbins participated in a NIMBioS-sponsored meeting prior to the conference on how to improve the quality of undergraduate biology education. "The conference definitely played a central role in my wanting to focus on academic research and teaching," Stebbins said. This year, the Goldwater Foundation awarded 278 scholarships from an applicant pool of 1,111 mathematics, science and engineering students across the U.S. This year’s recipients will receive up to $7,500 each.